Kuantan is situated on the East Coast of West Malaysia between the latitude of 3� 49' in the north and the longitude of 102� 25' in the east. On its eastern side is the South China Sea with a 56 km stretch of beaches (35 miles). 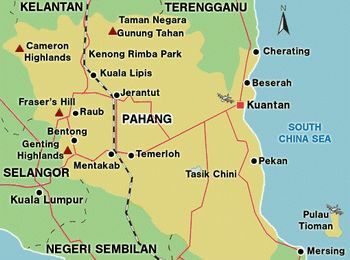 Maran and Jerantut surround it in the west, the state of Terengganu in the north and Pekan in the south. Kuantan has a population of around 140,000. As a tourist centre I wouldn't recommend a trip here as there was really nothing unique that couldn't be seen in the rest of the country. There are more tourist resorts about 50km north of Kuantan near the town of Cherating, including Club Med. Cherating, is popular with backpackers, has a lovely clean beach with swaying palms.